Defining the shorter veil let's say its shoulder length or above, made out a diaphanous fabric that flows like tulle or chiffon--not a pouf or cage style but an actual veil. The short veil has many names: petal veil, fly away, blusher. The good news is, there are no rules anymore about pairing them up with short dresses. Whatever works is the guideline and wearing one has more to do with following proportions and personal style. The shorter ‘fashionista' veil has not only gained in popularity, it's a bridal fashion fixture. 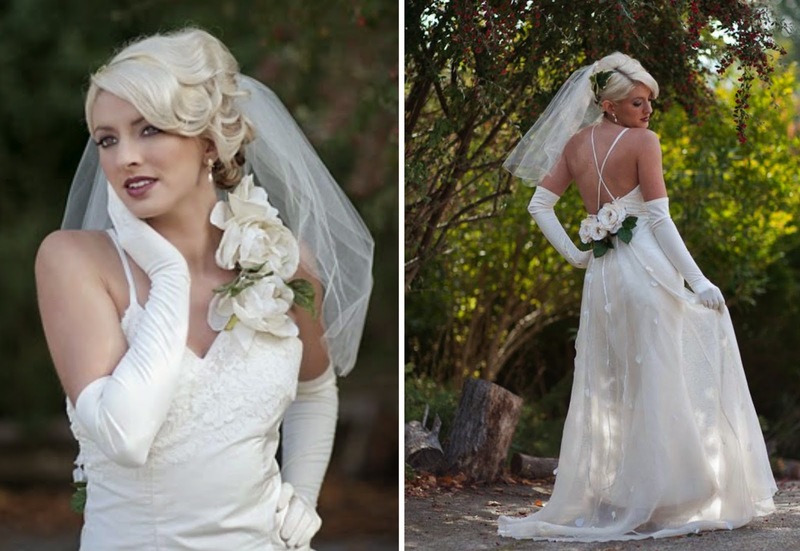 My client Monique put it succinctly: "I'm sure glad I chose a short veil. Now, I won't have to worry about rearranging or when to take it off.. I can enjoy my day. " Like Monique, most brides say the number one thing about wearing a shorter veil is, they don’t have to do any adjusting in that switch from the solemnity of ceremony to big time partying hearty. Shorter veils are easy to maneuver around in and stay put whether you’re exchanging vows, cutting cake or dancing..Since small veils are here to stay awhile, it will be interesting to see what designers come up with the next few seasons with all the new fabrics and materials out there.